Since becoming a "professional baker" (who is still very much in-training) I'm often asked if I have a good-slash-favourite recipe for all manner of things, and it's made me realise how poor my collection of stock recipes actually is. Sure, I have a few books and/or cooks-slash-bakers that I tend to turn to first, but "Do you have a good banana bread recipe? ", "Well...", "Oh, and what's a great recipe for making scones? ", "Erm..."
Part of the problem is that there are just so many different things out there that I rarely settle long on any given subject before getting distracted and moving on to the next "must try". But even when I do stay focussed on the one topic there's only so much of the same thing you (and your neighbours, colleagues, random passers by...) will happily eat, and trying to decide which of the multitude of variations you should attempt can easily get a tad overwhelming. The other problem is that everyone has a different opinion on what makes the perfect something. Take, for instance, sticky buns. Having realised recently that I didn't have even the beginnings of a go-to recipe I put out the call for suggestions. A number of people recommended the Bouchon Bakery version but, while sounding utterly delicious, it also appeared more of a caramel-glazed brioche than a proper sticky bun. Of course, for many that probably IS a proper sticky bun but to me, a sticky bun needs to be more bready. It should have a soft white crumb with that stretchy, almost chewy quality that I really need to work on being able to better describe. There should be a good amount of spice in the filling and I prefer them with nuts, which adds a nice textural contrast to the soft dough and sweet, sticky topping. They should be not long from the oven, as they are best enjoyed "still-warm", and have that just-right filling to topping ratio that immediately destroys any attempt at politeness as soon as you start eating them. For the dough, combine the yeast, sugar and slightly-warmed milk in the bowl of a stand mixer and leave for around five minutes, until frothy. Whisk in the butter, yolks and whole egg, followed by half of the flour. Add the remaining flour and salt and knead with a dough hook for 5-7 minutes, until you have a smooth, elastic dough. Transfer to a lightly oiled bowl, cover, and leave in a warm place for 1 ½ - 2 ½ hours, until doubled by half again. Meanwhile, prepare the filling by stirring together the sugars, spices, salt and zest. About an hour before the dough is ready, make the caramel by first melting the butter in a medium saucepan. Stir in the remaining ingredients, bring to a boil and then leave to simmer for 5-7 minutes, until glossy. Pour into the base, and up the sides, of a 25-cm square cake tin, then refrigerate until ready to use. To assemble the buns, roll the dough into a 30-cm × 45-cm rectangle, brush with the melted butter, and then sprinkle with the sugar filling and one-third of the chopped pecans. Working from a long edge, roll tightly into a log and then cut into 12, ~4-cm sections. Sprinkle the remaining pecans over the caramel and arrange the buns in the tin, cut side up. Cover and leave in a warm room for 1-2 hours, until risen and almost touching. Bake the buns at 175°C for 30-40 minutes, until puffed and golden. Rest in the pan for 2-3 minutes before turning out, spooning over any remaining caramel that's left in the pan. Serve warm*. ** Reserve two-thirds of the chopped pecans for the topping. 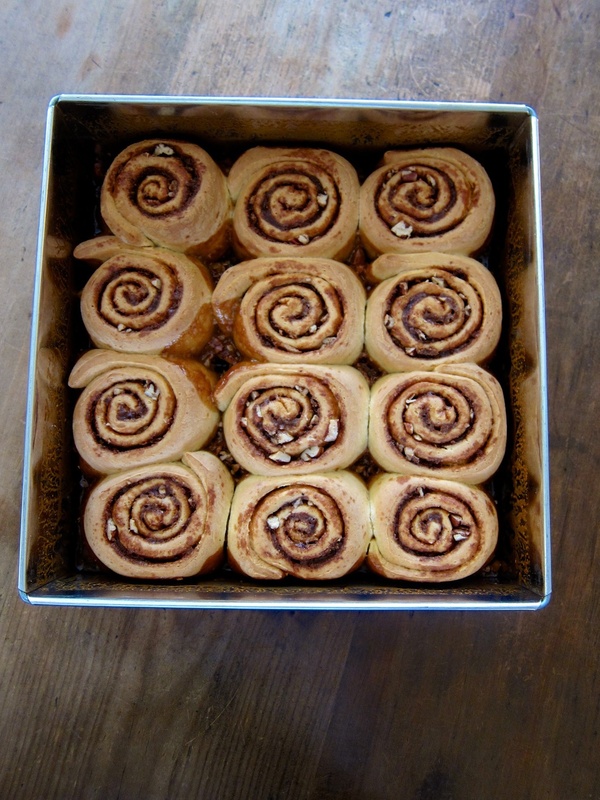 ** SK recommends storing any leftover buns in the fridge and rewarming just before serving.